Very disappointed, couldn't finish the book. Maybe some of the later stories in it were better than the first three, but got too bored trying to read it to even give them a glance.Skip this one! I read this because of Gabaldon's "The custom of the army" and that's definitly a 5 star story. Exciting, funny and beautifully researched historical context.The other stories were well-written but not that interesting (but that could have been me as I'm not a big fan of war-themed tales in general). They all had good story-lines but the writing lacked dynamic, perhaps because the characters were a bit flat. But still, alright for one-time-reading.The only story I only skimmed through was the one about the dog because I simply can't read anything that features cruelty towards animals. Something like that doesn't belong in an anthology like this one, in my opinion. Diana Gabaldon's Lord John tale is what drew me to this book, but being who I am, and with her story as the final tale in the collection... yeah... I read them all. Lawrence Block's Clean Slate was dark, slightly chilling, and well written. I've never read Carrie Vaughn, but greatly enjoyed The Girls From Avenger - a nod to the women who gave all to their country in WWII. Robin Hobb's The Triumph was a bonus for me.Nice diverse collection of stories! Un compilado que realmente me fascinó. Me gusta mucho la idea de darle a diferentes autores un solo concepto muy amplio y dejarlos escribir en base a su interpretación de eso. Las historias de guerreros de este libro van desde soldados y legionarios hasta perros y gente dañada por su pasado que solo busca sobrevivir. Muy recomendado. 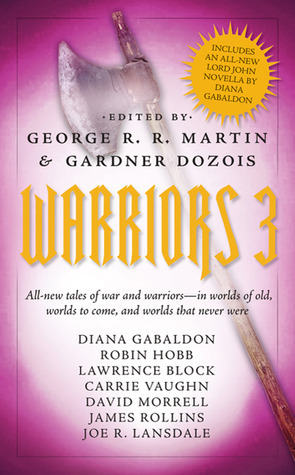 Warriors started well in the first book, but trailed in 2 and 3. Skipped most of the stories after a few pages. Did not buy into the one told from the perspective of a dog. A warrior, yes, but not i would put in a collection of books. The last story was interesting, if possibly implausible. The dog story, I could not read. The female killer story was really grasping at straws when it came to a "warrior" concept. Other stories are pretty forgettable. It being an anthology, I liked some stories better than others. A great collection of short stories; The Pit in particular tugged at my heartstrings. It's what I've come to expect from this anthology series, and that's a good thing. The stories was ok. Some stand out like "Clean Slate" by Lawrence Block and "The Pit" by James Rollins. The others more blend.